This is a wonderful tradition found in Bavarian taverns and beer gardens. Long before “food-sharing” became all the rage in trendy restaurants, we were there first. First, you “bleed out” the radish. This means salting each slice and waiting for it to be absorbed. Afterwards, everyone at the table is welcome to eat as much as they like, which creates a sense of sharing a communal meal. We recommend this drink: Löwenbräu Original is often ordered along with radish slices. 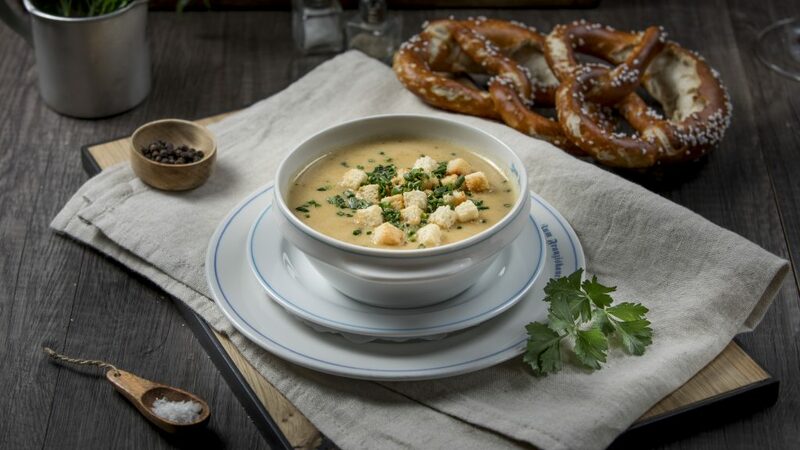 The deliciousness of Bavarian mushrooms, harvested locally, goes into the broth of this soup during a painstaking cooking process. The mushrooms are then chopped and the soup is made creamy with the addition of a dash of cream. 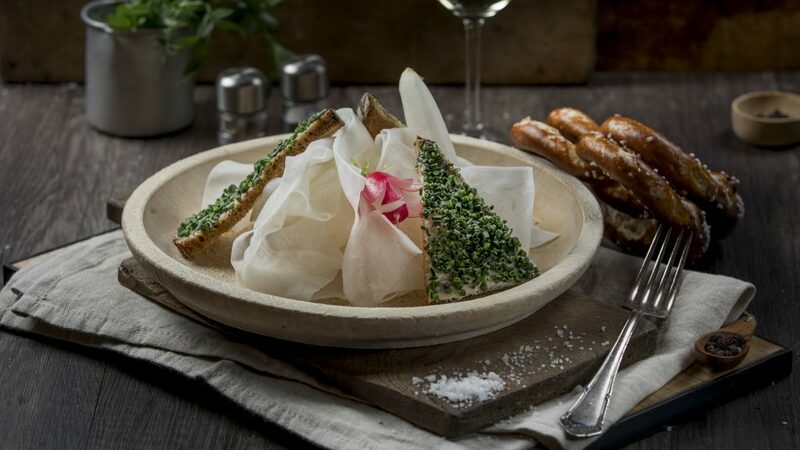 The unparalleled tastiness of forest mushrooms, such as Egerlinge and Schwammerl, paired with fresh herbs and croutons, is an appetizer you can’t miss here at the Franziskaner. 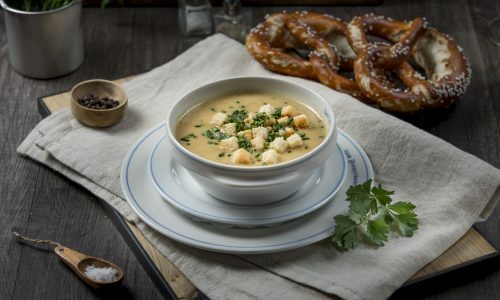 We recommend this drink: Our guests enjoy drinking Löwenbräu Original with their Bavarian mushroom soup. The mother of all Brotzeit experiences: This platter is piled high with fresh smoked Regensburger sausage, cubed cheese, ham-hock aspic, cabanossi sausage, radishes of all kinds (wild, red, and white radishes), and bread topped with chives. It’s enough to make any connoisseur’s eyes light up. We serve it with our grilled bread and, if you’d like, a couple of crispy pretzels. What else could your heart desire? 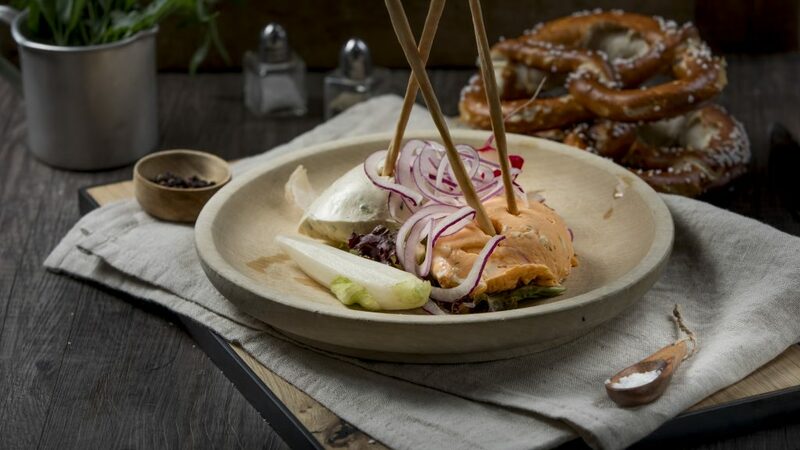 We recommend this drink: Any of our Löwenbräu beers would be great with this dish. 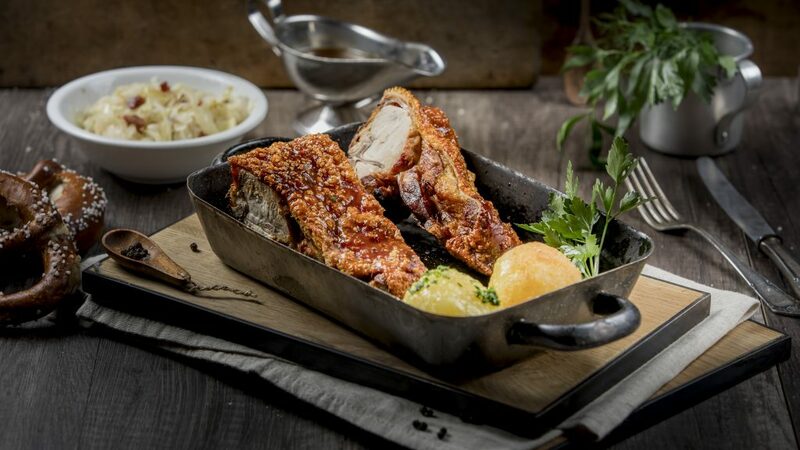 This dish is one of the delicacies symbolic of Bavarian coziness and Brotzeit. 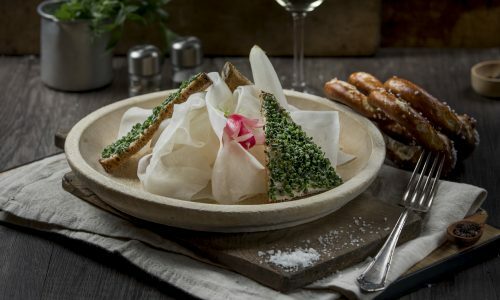 Our Obatzda features two colors and is served fresh on a wooden board with onion rings, white radishes, spring onions, and just-baked rustic bread. 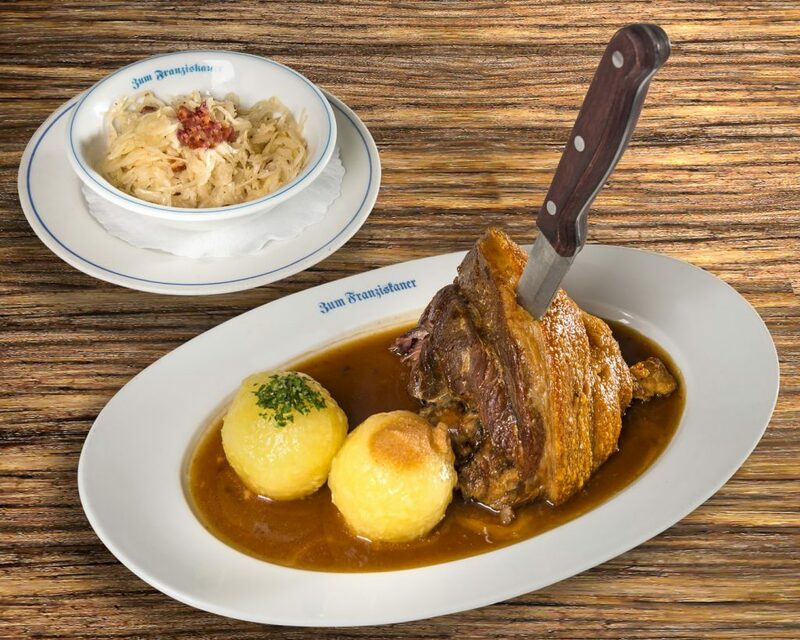 It’s a wonderful introduction to the Munich dining experience. Try it – it’s delicious. We recommend this drink: We think our Franziskaner Weissbier is perfect for this meal. 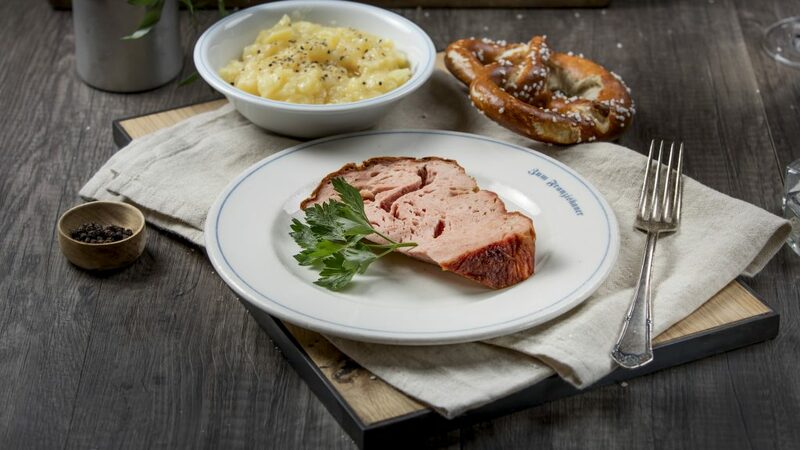 We’ve become famous for our Leberkäse far beyond the borders of Bavaria. Every day, we bake a fresh batch of our secret recipe in a specially designed oven for Leberkäse. If you sit down at one of our tables, you simply can’t leave without trying it. Our guests are particularly fond of snacking on it while having their morning pints here at the Franziskaner. We recommend this drink: Any of our Munich-brewed Löwenbräu specialties are wonderful with our Leberkäse. The best in the city – our reputation precedes us. 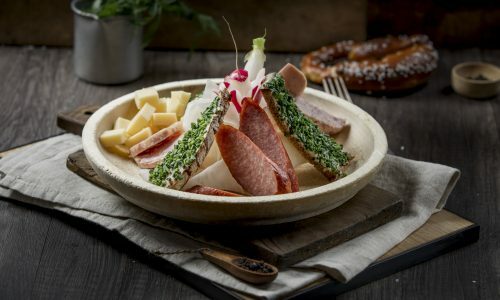 Just like with our Leberkäse, we never cut corners here, using only the best meat and freshest parsley for our trademark dish. We make fresh meatballs every day. Especially around lunchtime, our kitchen transforms into a meatball factory. Served with homemade sauce and warm potato salad with cucumbers. You simply have to try them. 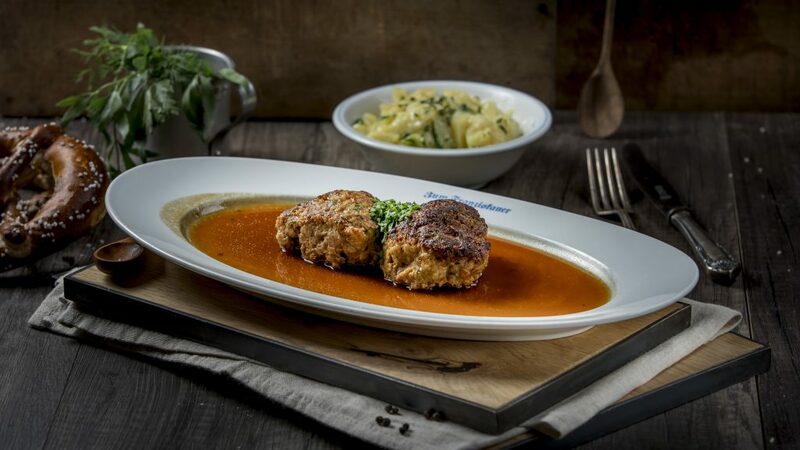 We recommend this drink: A Franziskaner Weissbier or refreshing Russn pairs perfectly with our meatballs. Our juicy pork roast with crackling is served with two potato dumplings, homemade pork gravy, and cabbage salad. 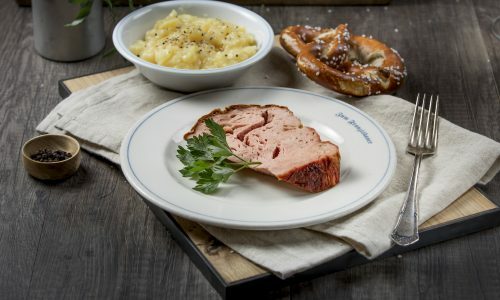 For years now, it’s been THE favorite dish here at the Franziskaner, no matter the season. 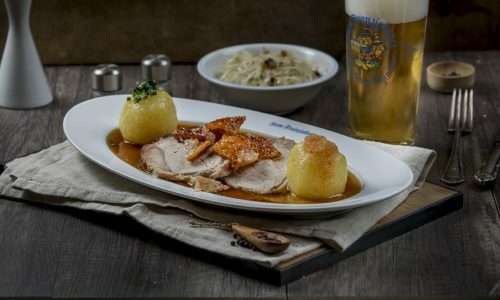 If you’re visiting Munich, don’t hesitate to order the pork roast. 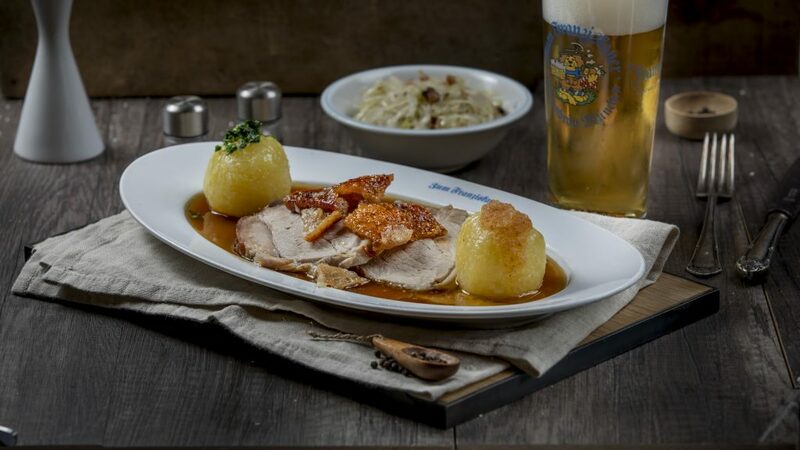 We recommend this drink: We recommend a freshly tapped Löwenbräu Original with the juicy pork roast. One of the highlights on our menu is Schweinshaxn, a ham hock taken from one of the pig’s rear legs. We serve it with two potato dumplings, homemade pork gravy, and cabbage salad. 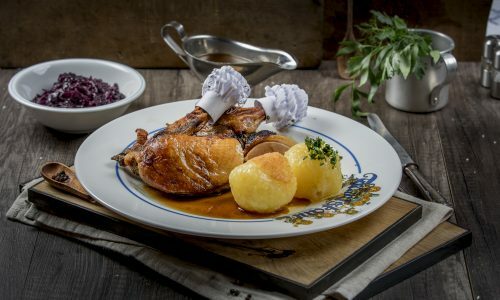 This way of preparing ham hocks is probably the most emblematic dish in Bavarian cuisine. Everyone’s familiar with it, and everyone should try it at least once in their lifetime. 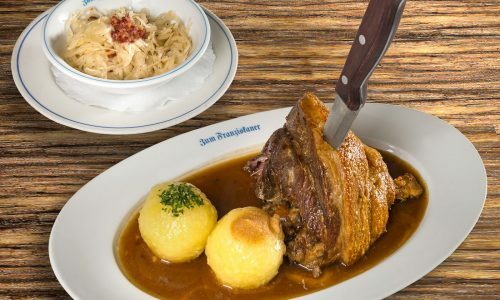 Don’t forget about the Franziskaner’s Haxe-Spezial either. We recommend this drink: Any of our many Löwenbräu specialties would be perfect with our ham hock. It’s THE decades-old tradition here at the Franziskaner. Rib-eye cuts of suckling pig with plenty of crackling, two potato dumplings, and warm bacon-and-cabbage salad on the side. The meat is so tender it melts like butter, has very little fat, and is particularly popular with women. We offer the choice between a “small” or a large portion. You can’t leave Munich without having experienced it – you’ll love it. We recommend this drink: The perfect complement to our crispy roast suckling pig is a freshly tapped Franziskaner Hefeweizen. 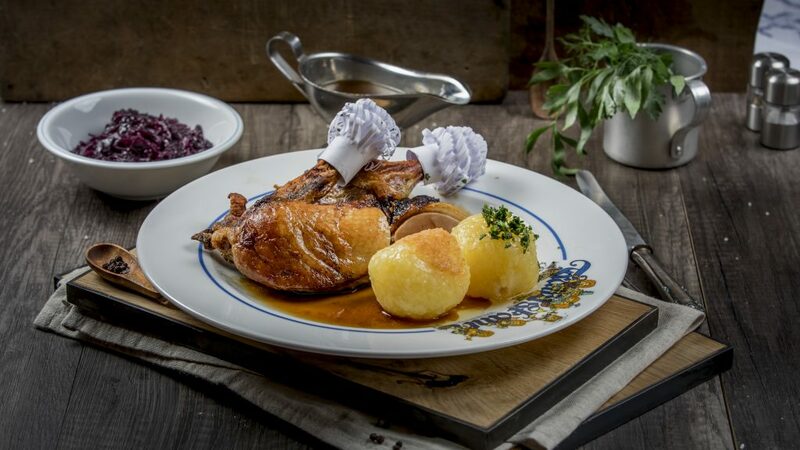 Our free-range ducks are all raised in nearby regions of Bavaria. We serve this dish with homemade stewed red cabbage and apples, two potato dumplings, and homemade duck gravy on the side. You can order either a quarter or a half of duck at the Franziskaner. No matter how hungry you are, our juicy duck will always provide outstanding flavor thanks to our specially designed duck grill. We recommend this drink: The best beverage to pair with duck is a full-bodied Franziskaner-Royal wheat beer or a glass of red wine. Our Wiener schnitzel is made using topside slices of veal. These are then breaded and fried in churned butter. 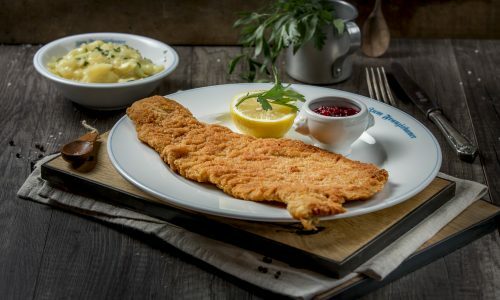 We serve our schnitzel with crunchy fries, lemon slices, and cranberry sauce. Experienced patrons of the Franziskaner will know to order a little Béarnaise sauce on the side. Gently tenderizing the meat brings out its quality. Try it for yourself! We’ll offer an “An guadn!” (“Bon appétit!”) in advance. We recommend this drink: Wiener schnitzel tastes best when paired with a foamy, freshly poured Löwenbräu Original. 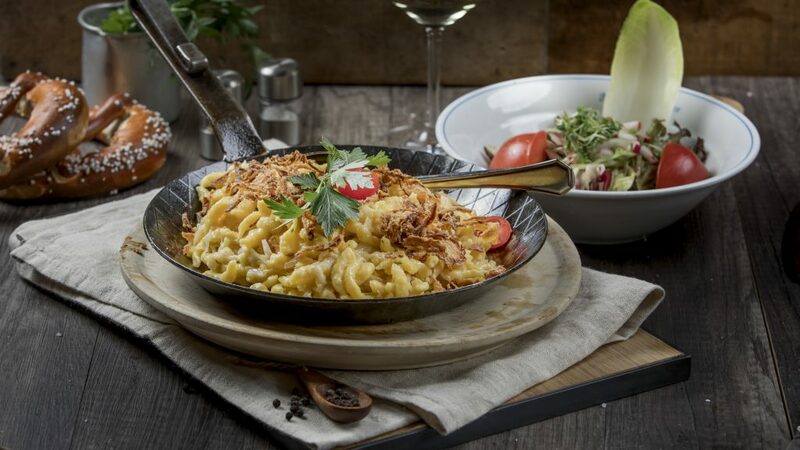 Our Spätzle (a type of German egg noodles) are truly special. 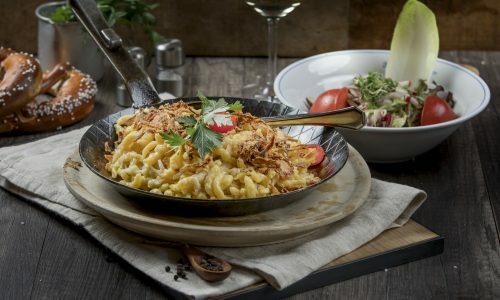 It’s not just that we serve them in a cast-iron pan – the combination of flavors is unique, even in Munich. 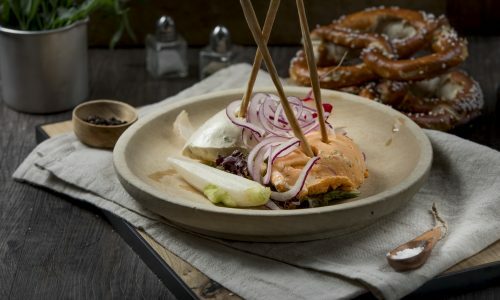 We mix these small egg-based dumplings with Allgäuer cheese, Bavarian sauerkraut, and gently sweated onions. After plenty of tossing in the pan, we bake the dish with cheese on top to produce a lovely crust. A few fried onions as a garnish, and your Allgäuer Kässpatzn (Franziskaner-style) is ready to eat. We recommend this drink: We suggest ordering the Franziskaner Leichte-Weiße (light wheat beer), which has a reduced alcohol content. 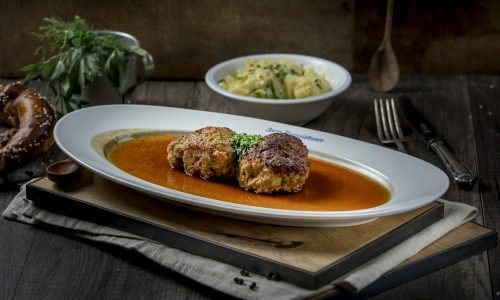 Since time immemorial, the Franziskaner’s filet of zander has been the most popular fish dish we offer. 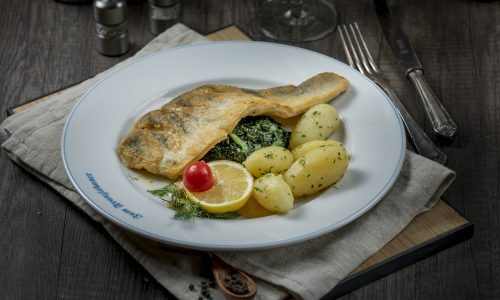 The fish is accompanied by small salted potatoes and fresh seasonal vegetables (pictured with spinach). It has a garnish of almond slivers. 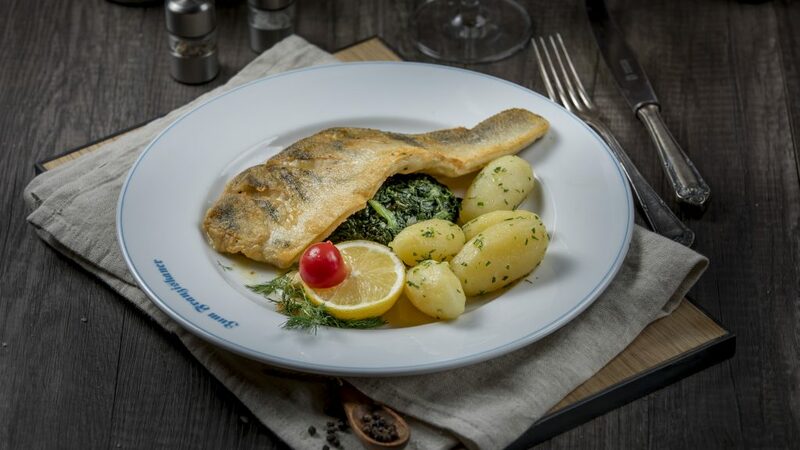 Our fish is caught in nearby Bavarian lakes, and we only work with local fisheries. We recommend this drink: A filet of zander practically requires a glass of Original Löwenbräu-Dunkelbier (dark beer) or a dry white wine. In summer and winter alike, we also offer lots of different vitamin-rich salads combining a variety of ingredients. Here we have an elegant arugula salad with a zesty balsamic vinaigrette and seared steak tips. It’s garnished with Parmesan slivers and fresh herbs. Our garden-grown tomatoes provide a lovely balance between acidity and sauce. 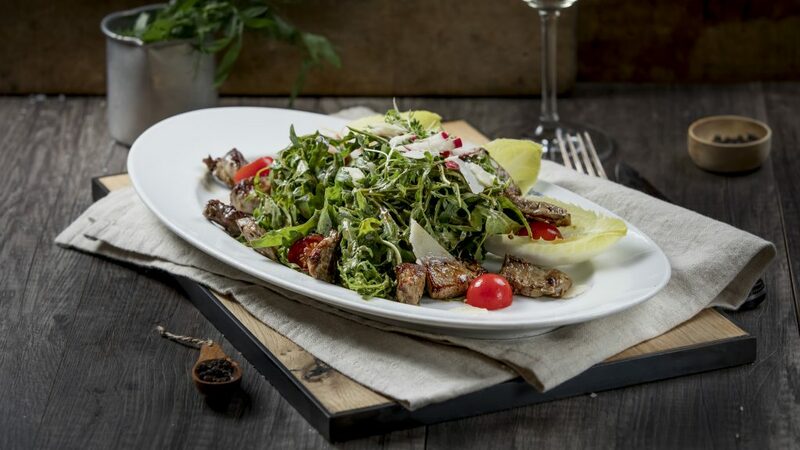 We recommend this drink: Try a tasty Löwenbräu-Original with your arugula salad. This is a classic way to end a wonderful evening here at the Franziskaner. Fresh from the oven, Kaiserschmarrn – shredded pancakes – enjoys an outstanding reputation well beyond the borders of Bavaria. We ALWAYS prepare it freshly, so you should order it along with your main course. We serve this Alpine dessert in a cast-iron casserole dish, topped with raisins (we can leave them out if you prefer), almonds, a light sugar glaze, and plum compote or applesauce. 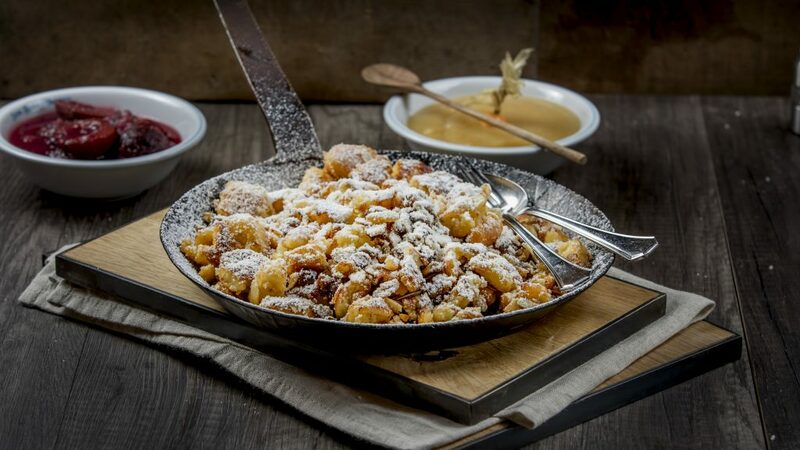 Please note that the Kaiserschmarrn can only be ordered for two people or more. We recommend this drink: A lovely mug of premium Dallmayr coffee or the subtle caramel notes of a Löwenbräu-Original Dunkel (dark beer). Book quickly & easily via our online reservation system below or call us directly at: +49 89 2318120.